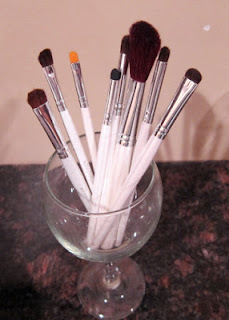 THE SKINNY: If you ever need extra makeup brushes or want to test out one of those specialty brushes, look no further than e.l.f. They sell most of their brushes for $1. And they're decent brushes, too. I've mixed a few of mine in with my higher-end brushes and really haven't noticed much difference. The e.l.f. brushes haven't been shedding hairs or losing their shape with repeated use. Best of all, because I didn't pay upward of $20 per brush, I don't feel bad throwing them loose in my makeup bag. KEEP OR TOSS: Keep. These are a great little find, especially if you want to experiment. CHECK IT OUT: e.l.f. also offers a Studio line of brushes. Most of those are $3 each.